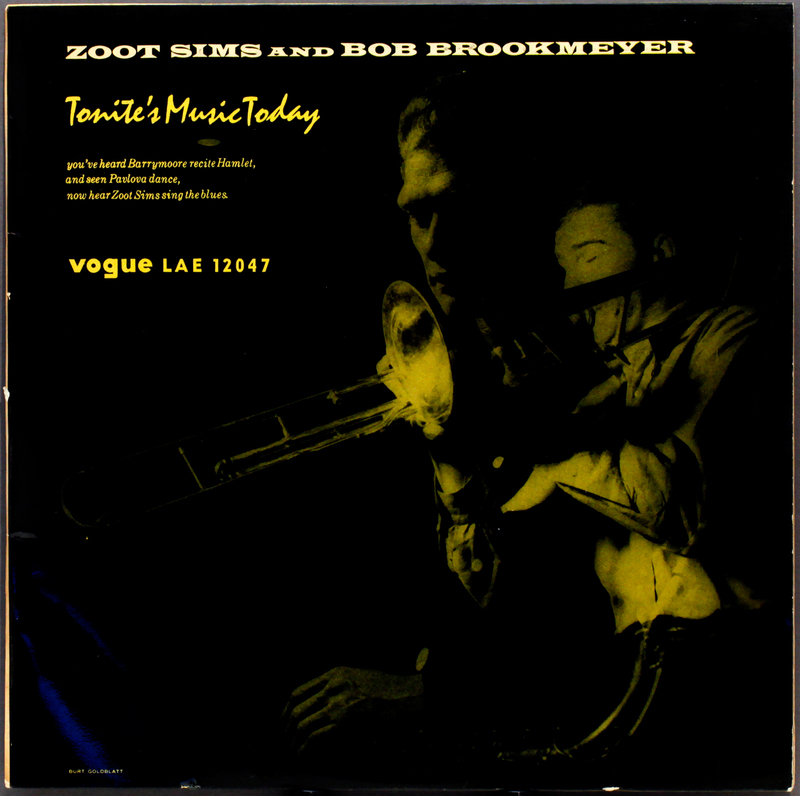 Brookmeyer died just a couple of weeks ago, in late December 2011, age 81. 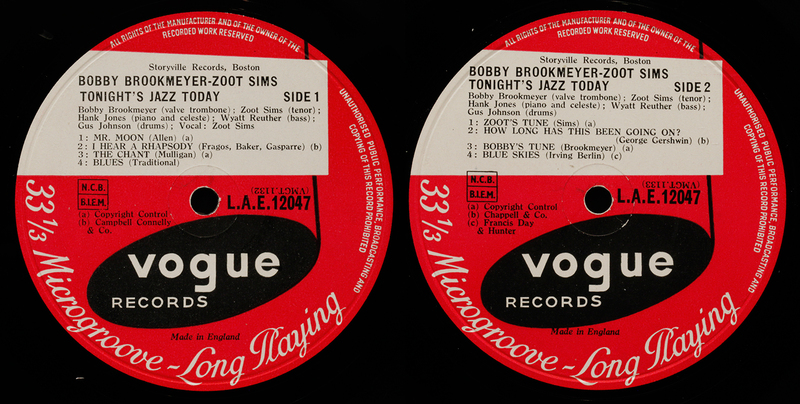 John Haley “Zoot” Sims wasn’t so lucky, passing away at the age of 60 in 1985. A songless track is offered by way of apology to any blues fans. Hank Jones is the unspoken star of the track Blues. When I used to listen to blues in the 1960s British “Blues Boom” I had a few traditional blues pianists albums – Eddie Boyd, Otis Spann, Champion Jack Dupree, and many I have forgotten. They were no match for “proper” jazz musicians like Hank Jones turning their hand to blues. And with the added spice of good saxophone, thank you Zoot. 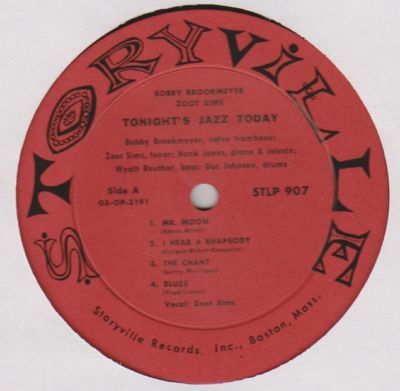 $75-300 as a Storyville original, this Vogue pressing (excellent, except for one track, with a short but audible spindle scuff on the blues-singing Zoot track, for about five revs) less than £20 on eBay. I guess I could have asked for an adjustment on account of the spelling mistake on the cover “Tonite” rather than as elsewhere, “Tonight”. Bit academic really. 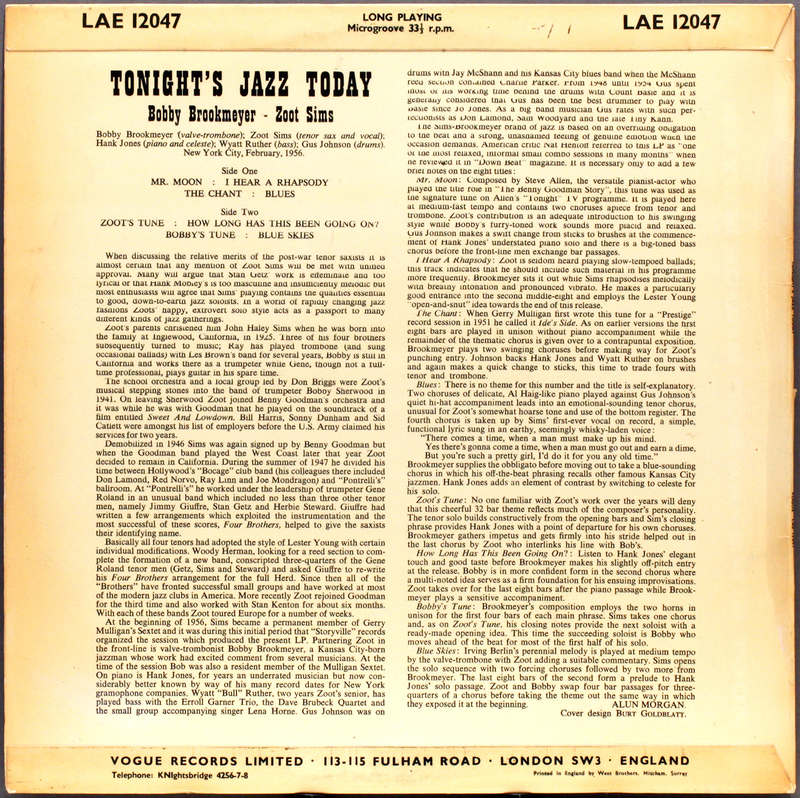 This entry was posted in Vogue, West Coast, Zoot Sims and tagged Bob Brookmeyer, Gus Johnson (, Hank Jones, Vogue, Wyatt Reuther, Zoot Sims by LondonJazzCollector. Bookmark the permalink.